Ruka resort is located in Lapland. Occupying a third of the country’s territory, the region has a lot to offer, on and off the slopes. During my trip last February I met Lotta and Jussi, owners of Outdoor Passion Finland, running outdoor activities in the arctic nature. Operating since 2006 they know the area like the back of their hand and give us a heads up on the best spots in Ruka. We do not have just one favourite run. Our favourite runs make a circuit-run, starting from the Ruka Village going up with the Front lift to the peak of Ruka. Continuing down the Vuosseli run down to the Vuosseli Express lift. If you want you can start the run by going in the Super Pipe, before sking down to the Vuosseli Express lift. Beeing back at the peak, we start with the Vuosseli run and in mid-section crossing down to the route to Saarua and the base of Ruka Park and Saarua runs. Taking the Saarua Express lift up and chilling down the Kuru run back to Ruka Village again. This is our sweet circuit of runs! 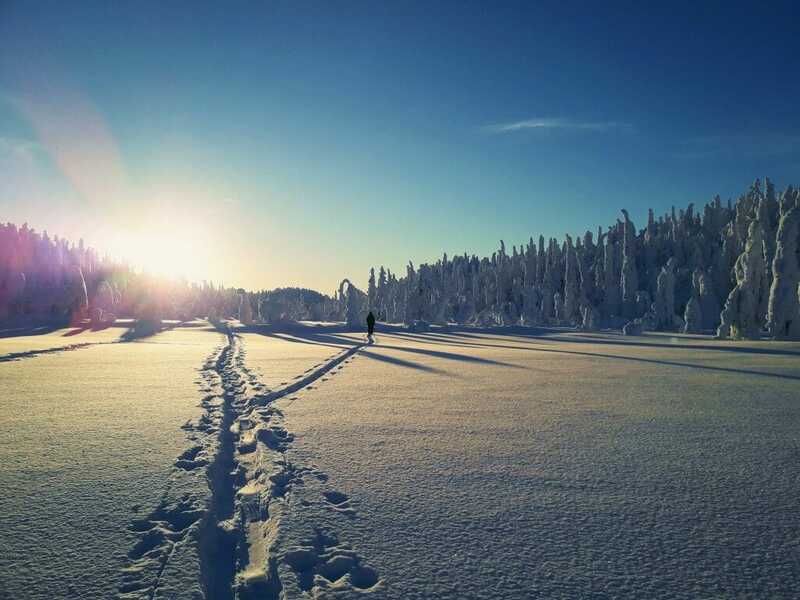 Our favourite skinbased ski touring spots are definately the Valtavaara nature reserve and Riisitunturi Nationalpark! Both have views over Ruka ski resort when sky is clear and they have special features that makes them same but different. Well worth visiting! 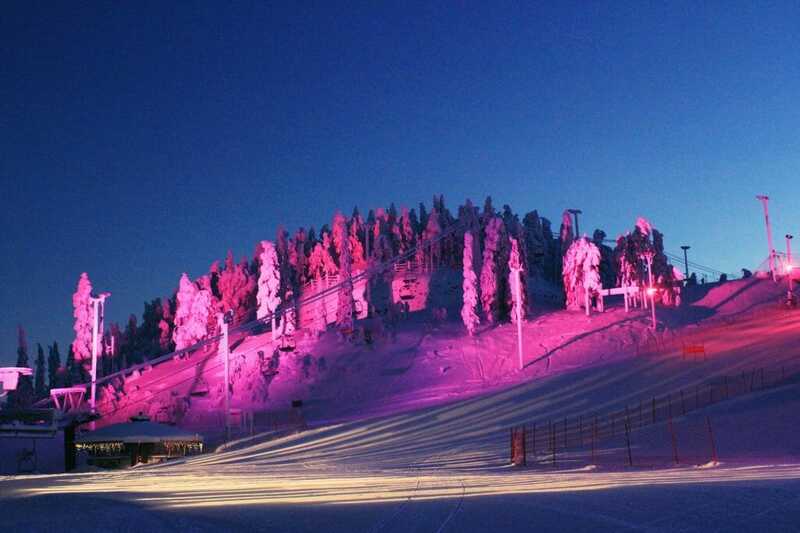 – Polar Night Light Fesivals – the whole Ruka ski resort is lighted up in various colours! – Ruka Easter events – spring-feelings, sunshine and pandas are starting to show up on the runs! – Oldest ski school in Finland. Founded in 1956. – Most snow secure ski resort in Europe. Over 200 ski days a year. – Most environmentally friendly Ruka Ski-Inn Apartments in Finland. Carbon footprint is zero. – Enjoy the Apré-Ski in style at the Champagne Terrace at Chalet Ruka Peak. Champagne will be found at the top of Masto runs! – Alpine style restaurant Monomesta at the foot of Pessari run. They have a relaxed athmosphere and a joyful feeling! – Kaarle XII Ski Ruka, the new After Ski terrace in the Ruka Village! Location good, easy access and perfect meeting point! Definately Hanki Baari! They have the most sweetest personnel and a relaxed vibe throughout the day. Good veggie food, sweet music events and it is just an easy and simple bar to meet new friends and have a informal lunch/dinner with friends and family. We like shops were we can find Finnish design, or ecologically friendly brands. Aste Brandstore can be found in the Kumpare shopping mall and it is a shop that present also smaller brands. They are very interested in the story behind the brands. We like to choose ecological and sustainable products! That’s why we choose Aste Brandstore. Morning – you have the whole day to adventure outdoors! If you are coming to our winter wonderland, you want to go ski touring, ice climbing, or downhill skiing, its always good to arrive in the mornings to be able to do as much outdoor stuff as possible! Or, if you come to explore the midnight sun and summer, you definitely need to be out early to feel the morning mist and silence. 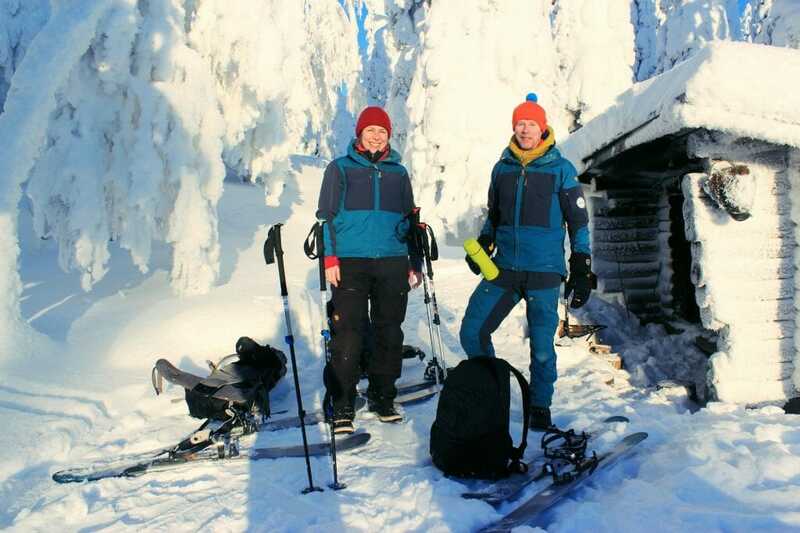 Outdoor Passion Finland has been around since 2003 with an early vision to be able to provide non-motorized activities to people staying in Ruka Ski resort and surrounding. We take you to basics in ice climbing in Ruka ski resort or to the legendary Korouoma nature reserve and go ski touring in Ruka backyard or Riisitunturi nationalpark with skinbased skis. Outdoor Passion Finland want people to go exploring their backyard at home or here with us! Welcome to Ruka and enjoy a sweet arctic holiday adventure!